Ethiopia’s parliament passed what experts consider the “strongest” tobacco legislation on the continent. The law aims to limit tobacco use in the second most populous country in Africa. Dubbed the Food and Medicine Administration Proclamation, the law was passed unanimously by the legislators and they’re optimistic it will help safeguard lives and protect the country’s huge population. It requires public and work environments to be 100% free from smoking, prohibits campaigns and publicity, limits the sale of laced tobacco products and mandates pictorial warning labels in 70% of the front and back covers of tobacco merchandises. The law also prohibits the selling of e-cigarettes, heated tobacco products, shisha, and bans the sale of tobacco products to persons below the age of 21. In a country with a population of approximately 105 million, 5% of adults use tobacco with 8.1% men and 1.8% of women engaged in the vice. 1.7% of adults use smokeless tobacco according to Tobacco-free Kids Organization. Among the youth (13-15 years), 7.9% use tobacco and related products. 29.3% of adults aged 15 years and above are exposed to secondhand smoke in enclosed places. 31.1% in restaurants, 60.4% in nightclubs and bars, while 11.4% in public transport vehicles. Youths aged 13 to 15 years are exposed to secondhand smoke in public areas, whereas 14.9% are exposed at home. According to Tobacco Atlas, 16,800 people die from tobacco-related diseases in the country. Furthermore, 18,000 children aged 10 to 14 years, and more than two million adults aged 15 years and above use tobacco products daily. Still, Tobacco-free Kids organizations estimate that 65 women and 259 men die each week due to tobacco-related causes. 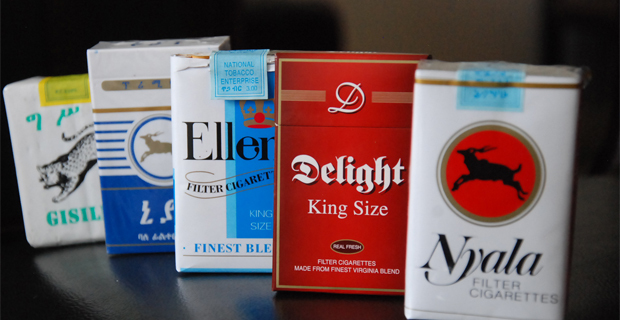 The six largest tobacco enterprises had a combined revenue totaling USD 346 Billion in 2016. This revenue is more substantial than Ethiopia’s Gross National Income by 380%. This industry is so dominant such that is doesn’t fear the actions taken by countries like Ethiopia because of their extensive global market share and resources. The country ratified the World Health Organization’s framework on tobacco control in April 2014, and it came into effect on the 23rd of June, the same year. Having enacted this legislation, the government must move swiftly and implement it as the authorities remain vigilant because tobacco companies will try undermining the progress it has made so far. The WHO reports that tobacco kills more than 7 million annually, with 6 million deaths resulting from direct tobacco use. The remaining 1 million are due to exposure to second-hand smoke. The government should also consider raising taxes on cigarettes. WHO recommends 70% Excise Tax but Ethiopia charges 13.9%.